Along with a host of other throat infections, some more serious than others, is a form of the complaint called mononucleosis otherwise known as glandular fever. This infectious disorder can cause some fairly nasty symptoms, but with rest and pain relief, a full recovery should be expected. What Exactly Is The Mononucleosis Infection? Mononucleosis, or glandular fever is caused by the Epstein-Barr virus and can be transmitted very easily between people during close contact or exchange of saliva.It is most commonly seen in teenagers and young adults but has the potential to affect anyone. A sore throat is usually part of having glandular fever and in many people it can be quite intense and affect the ability to swallow, even saliva. It is normally accompanied by extreme tiredness and lethargy and can bring flu-like symptoms such as headaches, aching limbs and tenderness to the touch. As the body tries to fight the virus, the glands become enlarged often narrowing the throat and sometimes being visibly seen as a swelling in the neck region. Other less common signs can be facial swelling especially around the eyes and a tenderness just where the ribs are found on the left side, this is due to an enlarged spleen, which although is not dangerous for most people, can be potentially very hazardous if it suffers a blow with physical contact. For many people the complaint can be treated at home with plenty of rest, pain relief and warmth.The infection can last for a few weeks, especially in adults and during this time you will probably find you have little energy.It is important to rest and sleep when you need to, making sure that you drink plenty of fluids to stay hydrated.Vitamin supplements and a diet rich in fresh fruit and vegetables (when tolerable due to the throat soreness) can help boost your immune system and fight the infection more quickly. If swallowing is a problem, fruits and vegetables can be blended into smoothies or shakes or even made into homemade soup.Pain relief such as paracetamol can be taken to help reduce the discomfort and lower a high temperature, and if swallowing a tablet is too difficult, try a dissolvable form in some fresh water or juice instead. As glandular fever is caused by a virus, anti-biotic therapy will have no effect unless the infection has developed into a bacterial type of infection, which often results in pus on the tonsils and long term and persistent symptoms. 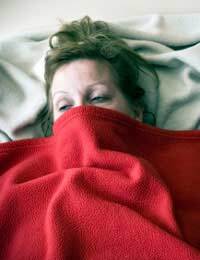 Glandular fever, or mononucleosis, is a viral infection that usually results in a sore throat, intense tiredness, aching and a fever. It can be treated conservatively at home, and care should be taken to prevent it from spreading to those around you.It is most common in young adults and teens and can take several weeks to be fully free of the virus even though you may feel better after a week or two. If you continue to have long term symptoms or they are getting progressively worse, please see your GP who may want to take a swab of your throat or a blood test to see if a bacterial infection has developed.